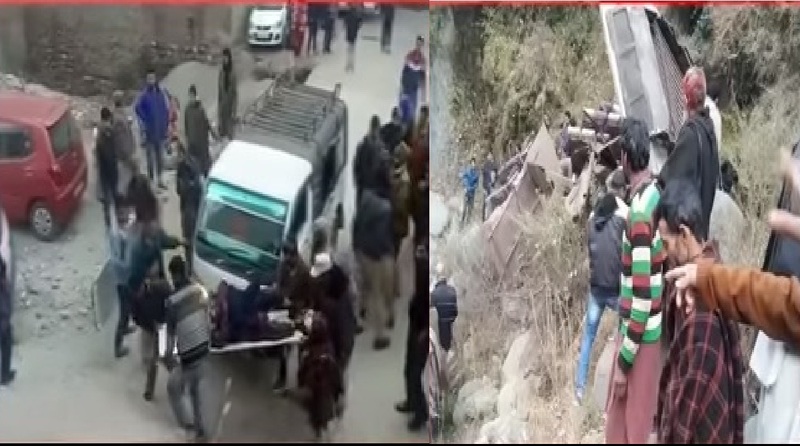 At least 15 passengers were killed and many injured when the rashly driven bus in which they were travelling in the Poonch district plunged skidded off the road and fell into a deep gorge in Plera in Mandi tehsil of Poonch district in the early hours of Saturday. Police said that the bus was bearing registration number JK02W0445 as per unofficial reports and yet to be confirmed. Reports from the site said that locals helped the officials and rescue workers in retrieving the bodies and the injured from the wreckage of the bus which lay near a river. The cause of the accident was yet to be ascertained. However, initial reports stated that the driver lost control of the vehicle while he was trying to negotiate a bend on the road. It is suspected that the driver was overspeeding and lost control while turning the bus on a tight bend. Nine critically injured have been flown to the Medical College Hospital at Jammu for advanced treatment. Reports say that the bus was overloaded and was being driven rashly when it plunged about 100 metres and ripped into two pieces. Governor Satyapal Malik has announced an ex gratia of Rs 5 lakh to the kin of each killed and Rs 50,000 to each injured. Former chief ministers, Farooq Abdullah, Omar Abdullah, and Mehbooba Mufti have expressed sorrow over the loss of life of passengers.